Alan started working in music composition and music production at age nineteen. He is also a self taught musician playing piano/keys, guitar and bass and has played in many different bands over the past 15 years. Working as a musician and sound engineer led Alan into working on various short films perfecting his sound design and music scoring techniques. This connected with his passion for film and in 2003 he produced the feature film “Minus Distance” which was well received at horror film festivals worldwide. In 2005 the film won best feature at the Indy Gathering Film Festival. 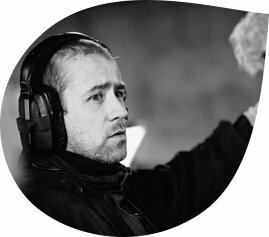 Since then Alan has trained as a camera operator, editor, cinematographer and worked on various commercials, music videos, short films and produced countless corporate training videos with Adaptas. In 2009 he directed his first short film, “Metanoia” which was screened at several festivals including the Galway film festival. He has since produced and directed two other shorts, “PIN/DO” (2013) and “ZERO” (2015) as part of his company Hatchland Films. www.hatchlandfilms.com. Alan founded and is part of the media production collective Little Bee Media (www.littlebeemedia.com). Little Bee Media focuses on commercial media production. Alan also actively produces his own music as well as collaborating with other artists in the production of their albums. https://soundcloud.com/alanjosephtully In 2012 Alan worked as a musician and composer on the Roisin O album “The Secret Life of Blue”. Alan produced the soon to be released album “A Moment’s Forgiveness” by Per Tenebras. He composed and produced the soundtrack and sound design for Conor Maloney’s short film “Ayame” featuring John Hurt which is scheduled for release in 2015. He writes screenplays frequently with his brother Steven Tully and together they have written several feature films which are awaiting production.